If you grew up loving choose your own adventure books or video games, RYOT’s new 360° interactive comedy Door No. 1 for Hulu will send you right back to being a kid — actually it’ll send you back to your 10 year high school reunion so more like excited anticipation mixed with a little dread. Hulu recently released its first VR app, Hulu VR, and with it a new test creative concept. Will a mainstream comedic interactive experience starring well-known comedians (and potentially a run-in with Snoop Dogg) play in the VR world? You’re the star of your own story in Door No. 1. The first-person POV lets you choose which path you’ll take in an attempt to track down and hook-up with your high school crush. And we, for one, are ready to high-five at a pep rally for it. RYOT is one of the leading 360/VR immersive content studios. The team, known for its documentary-style for the greater good content, caught the eye of Arianna Huffington and is now the VR arm of HuffPost/AOL. 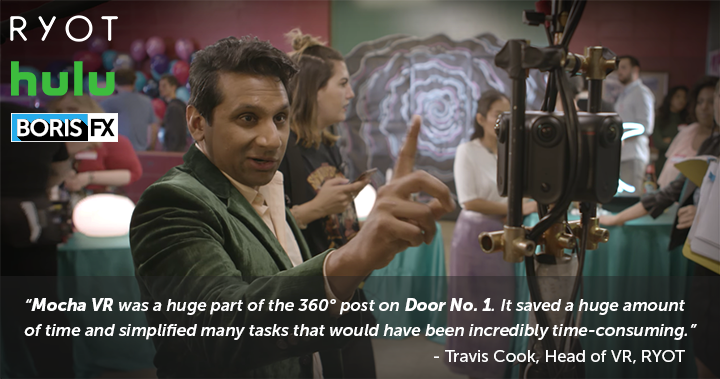 We recently chatted with Travis Cook, Head of VR and Immersive, and Ian Denig, VR Technical Director, to talk Door No. 1 and how their Adobe Creative Cloud based post-production workflow is complemented with professional plug-ins from Boris FX. Mocha VR and the Continuum VR Unit helped finish and finesse the final 360° delivery and ended up playing a large role in the choose your own adventure/interactive experience. Why did RYOT make the leap to 360° filmmaking? Denig: RYOT began in 2013 as a news site aimed at delivering something a little different — the ability to take action on the stories you read. With every story’s call to action, you had a chance to actually make a difference. Naturally, when empowering people to get involved, you want to give them the best understanding of what’s happening and what this story looks like, so the move to 360° was an obvious way to do that, and really bring our viewers to the story. We’ve been able to bring our viewers around the world to far reaching places virtually everywhere and to events like The People’s March in DC, the DAPL protests at Standing Rock, and the 2016 presidential campaigns. As VR Technical Director and Head of VR and Immersive, what do your jobs entail? Denig: I focus on our 360° production and VR workflows. I generally spend a lot of time on set, often acting as the DP, DIT, data wrangler, and VFX supervisor, and when I’m in the office I work on stitching, compositing and effects, and Unity integration. Cook: I oversee a lot of the production and post production of 360° and VR content we create. I keep tabs on the newest technologies and subsequently spend a lot of time with my team troubleshooting the new technologies we try. I find that while people with a background in traditional filmmaking who start working in VR have a leg up when it comes to storytelling, they often need to unlearn or adapt a lot of the traditional techniques and rules because 360° media is such a unique artform. VR technology also moves so quickly that it is anyone’s guess what kind of content we will be producing down the road. 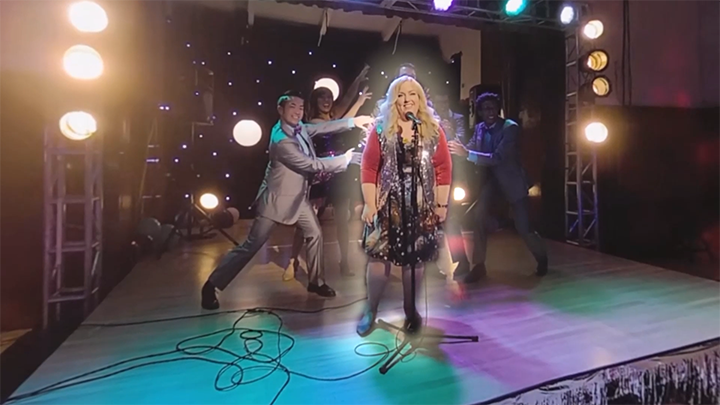 How has the addition of Mocha VR into your pipeline helped streamline your 360° post and VFX? Denig: Mocha VR has quickly become a major part of our post-production pipeline. We’re deeply embedded in the Adobe Creative Cloud suite, so Mocha VR’s availability as a plug-in is a great asset to us. Horizon stabilization is definitely a big feature for us. Getting rid of that nausea-inducing horizon warp is really important. It’s also important to use the Object Removal to take those rovers and drones out of the shot, so that’s our next most utilized tool. From using the Continuum VR Unit in Premiere Pro to the more robust Mocha VR interface in After Effects, the Boris FX VR tools have given us an increase in productivity without adding additional renders or branches to our process. There are other tools available, but there’s generally a steeper learning curve, investment in time or simply a cost that prohibits us from exploring too deeply. Mocha VR strikes the right balance of ease of use, compatibility, and cost to achieve exactly what we need in a versatile post-production tool. What are the differences between producing 360/VR documentary versus the scripted narrative of Door No. 1? Cook: I think the strongest hallmark of a good 360° video project is an urge to want to participate in the action in front of you. While watching TV shows and movies is generally a passive experience, I find that VR works best as an active medium. Door No. 1 was created as an interactive VR experience because the filmmakers wanted the viewer to be the lead in their own movie. Instead of watching the story unfold from the storylines, Door No. 1 puts you in the center of the action where your choices have real impact on the characters around you. We have created a story that the viewer can explore for themselves and hopefully feel a sense of ownership in the stories you uncover. You used Mocha to help define the onscreen interactive choices for the viewer. Can you explain how this happens? Denig: Each part of the branching story in Door No. 1 poses a choice to the viewer. The project utilizes Unity to leverage gaze control from the headset, activate the decision, and actually craft the glow for the choices, but the rotoscoped masks are what determine the shape of the effect. 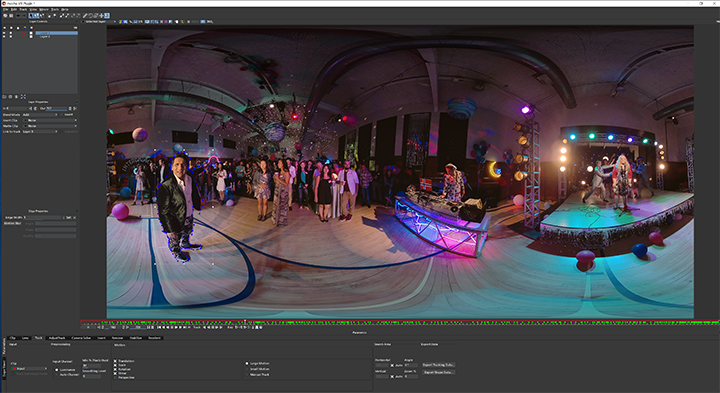 Between Mocha’s planar tracking and some keyframing, we were able to generate these meticulous, moving shapes on an equirectangular frame, and Mocha VR would automatically optimize the shape for the 360° panorama, greatly simplifying the process for us. A simple shape data export from Mocha with a compile into an XML document for Unity to read, and we have glowing shapes to illustrate your choices! Cook: Branching narrative is a challenge in that you need to produce much more content than the total running time of the experience. We ended up with about an hour of finished 360° video, but the experience only lasts about 15 minutes. The upside to this is that you can rewatch Door No. 1 multiple times and see a different story unfold each time. What other 360/VR tools do you use together with Mocha VR and the Continuum VR Unit? Denig: Like the cameras we’ve used, our workflow is in constant evolution. Because the industry is so young, there are new tools every few months. But we’ve used everything from PTGUI, Autopano Video/Giga, and Mistika VR for manual stitching, as well as cloud solutions for specific camera models like the Jaunt One and Google Jump platform, Adobe Premiere Pro and After Effects with the immersive video effects (formerly Mettle Skybox), DaVinci Resolve, and ProTools HD are some of our standards for post-production. And we typically rely on Unity for VR interactivity. Any thoughts on the future of 360° video? Denig: It’s clear to us that the future of VR is very bright. There’s such a distinct opportunity here to continue telling stories that are unique to this new format and the freedoms it provides. Headsets will continue to improve in viewable resolution and interactive capability, and the stories we tell are going to continue to leverage the new tools that accompany them. We’re just beginning to tap into that with Door No. 1, and we’re looking forward to bringing more experiences with increased interactivity to a wide range of viewers as VR becomes ubiquitous. With the release of the Oculus Go, there’s now a compelling headset that will provide great experiences without the clunky process of attaching a mobile phone or without the significant investment of a tethered high-end gaming rig.